There has been a previous extensive transmural myocardial infarction involving the free wall of the left ventricle. 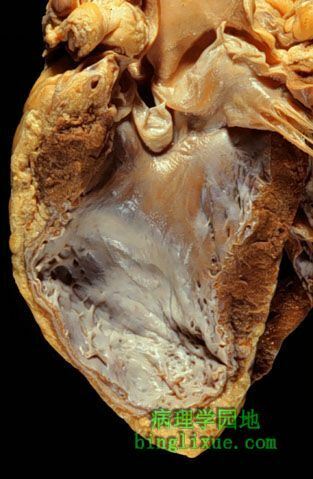 Note that the thickness of the myocardial wall is normal superiorly, but inferiorly is only a thin fibrous wall. The infarction was so extensive that, after healing, the ventricular wall was replaced by a thin band of collagen, forming an aneurysm. Such an aneurysm represents non-contractile tissue that reduces stroke volume and strains the remaining myocardium. The stasis of blood in the aneurysm predisposes to mural thrombosis.